As shown previously, giving all three compounds caused highly significant increases in total brain phospholipids and in each major phosphatide; giving DHA or UMP (plus choline) produced smaller increases in some of the phosphatides. DHA plus choline improved performance on the four-arm radial maze, T-maze, and Y-maze tests; coadministering UMP further enhanced these increases. DHA plus choline improved performance on the four-arm radial maze, T-maze, and Y-maze tests; coadministering UMP further enhanced these increases. Hence, giving uridine and DHA may partially restore dopaminergic neurotransmission in this model of Parkinson's disease. Oral administration of circulating precursors for membrane phosphatides can promote the synthesis of new brain synapses. 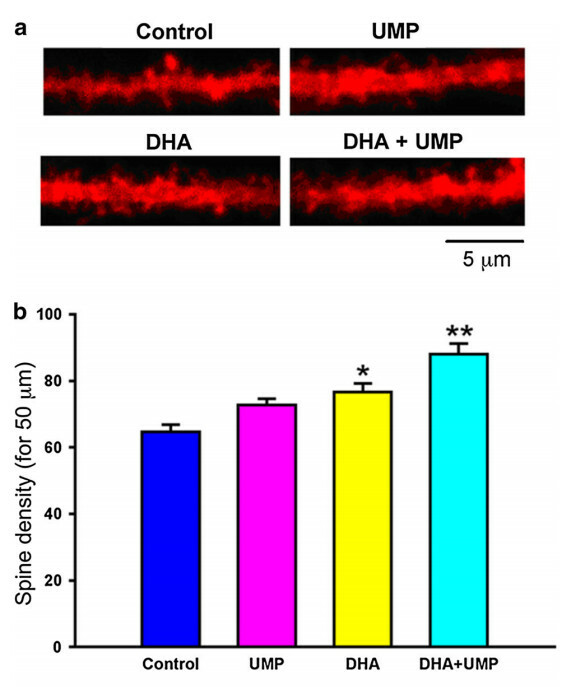 They also exhibit increased numbers of dendritic spines on postsynaptic neurons. These actions are markedly enhanced in animals that have also received the other two circulating precursors for phosphatidylcholine, uridine (which gives rise to brain uridine diphosphate and cytidine triphosphate) and choline (which gives rise to phosphocholine). it is possible that giving uridine plus DHA triggers a neuronal program that, by accelerating phosphatide and synaptic protein synthesis, controls synaptogenesis. During 24 weeks, memory composite scores from the Souvenaid group were significantly better than those from the control group. Effects of Souvenaid on plasma micronutrient levels and fatty acid profiles in mild and mild-to-moderate Alzheimer's disease. These data show that circulating levels of nutrients known to be decreased in the AD population can be increased in patients with mild and mild-tomoderate AD by 24-48-week oral supplementation with Souvenaid. Antidepressant-like effects of uridine and omega-3 fatty acids are potentiated by combined treatment in rats. Uridine and OMG each have antidepressant-like effects in rats. Less of each agent is required for effectiveness when the treatments are administered together.